NELSON TEMPORARILY COMMANDER-IN-CHIEF IN THE MEDITERRANEAN.—RELIEVED BY LORD KEITH.—APPLIES TO RETURN TO ENGLAND ON ACCOUNT OF ILL HEALTH. AUGUST, August 1799—JUNE, 1800. AGE, 41. Upon Keith's departure, the command in the Mediterranean devolved upon Nelson, who for some time remained in doubt of the fact, but with his usual promptitude acted as if all depended upon himself. "I am venturing certainly out of my line of duty, but as the commander-in-chief may not even be on the station, I must do the best which my judgment points out during his temporary absence." Six sail-of-the-line, under Admiral Duckworth, were sufficient for service at Gibraltar and Cadiz, if the latter port was deserted. Four of the line were about Minorca, constantly, though inefficiently, threatened from the adjacent coasts of Spain. Three were blockading Malta, conjointly with the Portuguese vessels. Sidney Smith with his division remained in the Levant. Troubridge was operating with a few ships on the coast of Italy, against Civita Vecchia, still in the hands of the French. A small squadron was maintained on the Riviera of Genoa, disturbing the communications of the French, and keeping touch with the advance of the Austro-Russians; but it was expected that the Russian fleet, as was natural and proper, would soon assume the duty of co-operating with their general, Suwarrow. The smaller British cruisers were distributed among these various duties. The flagship "Foudroyant" was at Palermo, whither the King returned from Naples on the 8th of August, and there the headquarters of the squadron remained during Nelson's command. Soon after this arrival in Palermo the King conferred upon him the title of Duke of Bronté, with an estate of the same name in Sicily, valued at £3,000 per annum. After this the admiral for a time signed his papers as Bronté Nelson, changed subsequently to Bronté Nelson of the Nile, and finally settled down to Nelson and Bronté, which was his form of signature for the last four years of his life. He placed upon his new estate an annual charge of £500 in favor of his father for the term of the latter's life. "Receive this small tribute, my honoured father," he wrote, "as a mark of gratitude to the best of parents from his most dutiful son." On the 20th of September he received letters from the Admiralty, investing him with the chief command, "till the return of Lord Keith or some other your superior officer." He was not, however, allowed the appointments of a commander-in-chief, and often complained of the inadequacy of his staff to the extent of his duties. 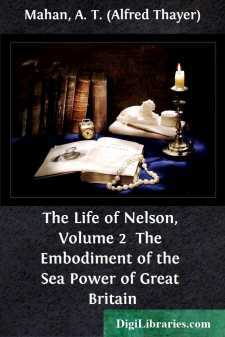 Nelson naturally hoped that his long and eminent services in that particular field, and the conspicuous ability he had shown on so many occasions, would lead to the station remaining permanently in his hands, and that Lord Keith, who was now in England, would succeed in due course to the Channel Fleet, whose commander, Lord Bridport, soon after retired. The Mediterranean was naturally attributed to a vice-admiral, and one of some seniority; but Nelson was now a rear-admiral of the Red, the highest color, not far, therefore, from promotion, and it would not be an unreasonable conclusion that the same ministry which had been fortunate enough to choose him for the campaign of the Nile, might now prefer to entrust to such able and enterprising hands the great interests of the Mediterranean at large.